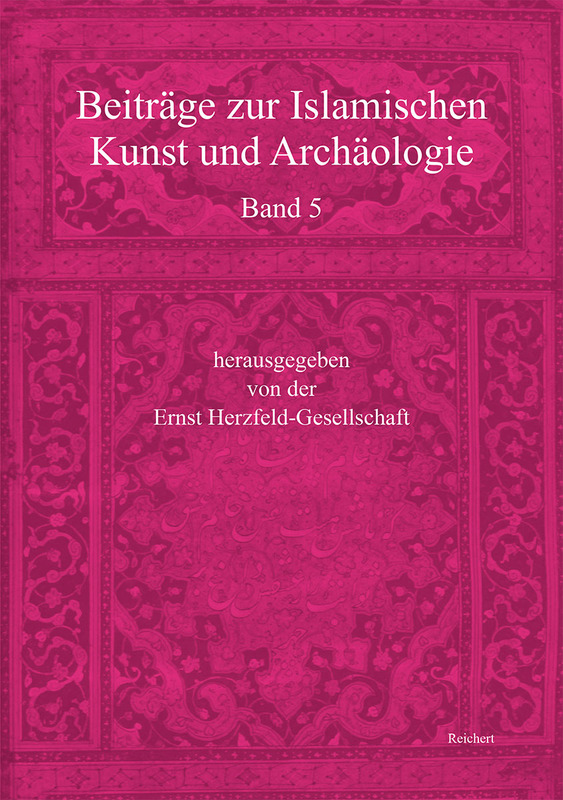 Geographically spanning from Spain to Central Asia, the themes included in the fifth volume of Beiträge zur Islamischen Kunst und Archäologie encompass architecture, archaeology, and urban history, painting and the arts of the book, restoration, and historiography. While two contributions are concerned with the Early Islamic and Early Medieval periods, the majority of the articles deal with topics from Early Modern and Modern times. Together, they shed light upon a wide range of current research topics and approaches. The fifth volume of the periodical offers studies and essays by an international range of established and younger scholars on three themes in Islamic art history and archaeology: architecture in relation to urban history; relations between image and text in literary and religious writings; the arts and perspectives of the Modern period in relation to earlier traditions. The contributions cover a geographic range from Spain to Central Asia. They focus on the Early Modern and Modern periods, while two deal with themes of the Early Islamic and Early Medieval periods. Several articles reflect on the historiography of Art History and of Archaeology in Islamic lands. The authors of the volume are based in Austria, France, Germany, Great Britain, Iran, Spain, Switzerland, and Turkey. Dealing with cities in Spain, Marcus Heinrich Hermanns presents new research in maritime archaeology of eighth to thirteenth-century al-Andalus, while Carmen González Gutiérrez looks into the urban history of Medieval Islamic Córdoba through the evidence of quarter mosques. Relating to Persian speaking regions in the Early Modern period, Mustafa Tupev dwells on architectural patronage of Shaybanid madrasa buildings in Bukhara; Safa Mahmoudian and Mehrdad Qayyoomi Bidhendi examine water management in the urban environment of Safavid Isfahan. The section on image and text opens with Persian manuscript painting. Ilse Sturkenboom discusses images of Solomon and the Queen of Sheba in relation to the poetry of Attar in fifteenth-century manuscripts. Lâle Uluç studies the illumination and production of manuscripts in Shiraz, based on a sixteenth-century copy in the Bodmeriana at Geneva. Tobias Nünlist investigates Islamic illuminated devotional scrolls related to dervish orders in the seventeenth-century Ottoman Empire, entering a field that did not receive much attention from students of Islamic art. The section on modern perspectives in the late nineteenth and early twentieth century starts with Alice Bombardier’s critical acclaim of the revival of Persian miniature painting by the artist Hosayn Behzad. Wendy Shaw examines meanings invested in archaeological sites of the Late Ottoman Empire through the writing of the scholar Hüseyin Zekai. Francine Giese traces the modern history of the famous early medieval wall mosaics in the Great mosque of Córdoba. Negar Hakim highlights the oeuvre of Gabriel Guevrekian, one of the central figures of Early Modern architecture in Iran. Markus Ritter, Professor History of Islamic Art, Department of Art History, University of Vienna, Austria. Doctorate (2003) on nineteenth-century religious building in Iran, taught as lecturer and professor at universities in Bamberg, Frankfurt am Main, and Zurich. Works on art and architecture of the Medieval to Pre-modern periods in the Persian and Arabic speaking regions of Islamic Western Asia. Publications include monographs on Persian architecture, on Early Islamic Arab palace building, Medieval book art of the Qur’an, articles on different media in Medieval Islamic art, on its European reception, and several edited volumes.